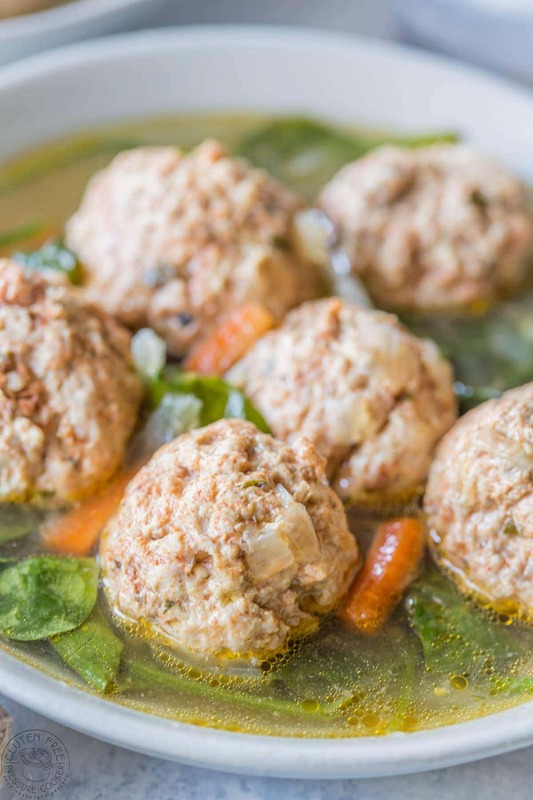 Easy pressure cooker Italian Wedding Soup, this recipe is gluten free, paleo, Whole30, low carb and healthy, and is perfect to make in your Instant Pot or any other electric pressure cooker! 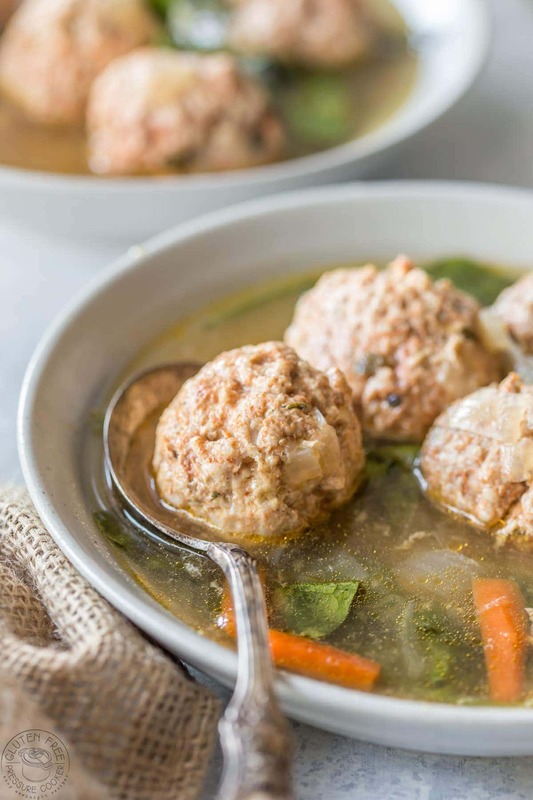 Italian Wedding Soup, or simply wedding soup as it’s also known, is an Italian-American creation that consists of green vegetables such as cabbage, kale, or spinach, and small meatballs cooked in a light broth. It often contains tiny pasta like orzo and sometimes parmesan cheese and is a popular option in many Italian restaurants such as Olive Garden and Carrabba’s. I wanted to make a pressure cooker Italian Wedding Soup that is both Paleo and Whole30 compliant so I don’t have any gluten free pasta in my recipe, if you are following the whole30 diet you’ll want to omit the parmesan cheese at the end. 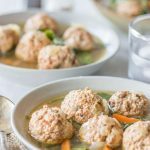 My pressure cooker Italian Wedding soup is really easy to make and cooking it in your Instant Pot is a breeze! You start off by using Italian Sausage and forming it into even sized meatballs that are about the size of a golf ball, or slightly smaller. I like to saute the onions and carrots in the inner pot for a few minutes until they are soft, then I simply add the meatballs and chicken broth and cook on high pressure for 5 minutes. I add the spinach at the end after the cook time is up, it doesn’t even really need to be cooked as it wilts almost as soon as you add it to the hot liquid. I made the meatballs with Italian pork sausage meat and shaped it into about 12 meatballs. The soup also has onions, garlic, carrots and spinach. As I mentioned above the spinach is added at the last minute because it takes just a minute or so to cook. 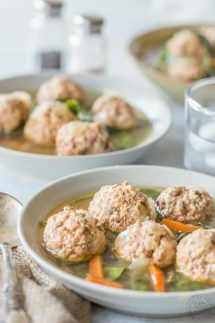 Easy and healthy recipe for fresh tasting Pressure Cooker Italian Wedding Soup. Shape the Italian sausage into equal sized meatballs, it should make about 12 - 15 meatballs. Turn on the saute function on your Instant Pot or other electric pressure cooker and adjust to the medium heat option. don't wait for the display to say 'hot', add olive oil right away. Add the chopped onions and carrots and saute for two to three minutes. Add the chicken stock, garlic, salt and pepper to the pot with the vegetables, using a spatula make sure you scrape up any vegetables that may be stuck to the pot now turn off the saute function. Add the meatballs to your Instant pot, Lock the lid, turn the steam release vent to 'sealing' and using the manual setting, adjust it to cook for 5 minutes at High Pressure. When the cook time time is up, allow the unit to reduce pressure on its own without opening the steam release vent (Natural Pressure Release) for about 10-12 minutes, then you can gently release the rest of the pressure by opening the vent. Add the spinach leaves and stir well into the soup. They should be wilted after just a couple of minutes, I usually sit the lid loosely on top until they are soft, about two - three minutes. I’ve never tried this soup before but it looks nice, thanks for the recipe. I made this soup and it was amazing. The only thing that I would do different next time is try some hot Italian sausage. The mild was good, but I think the hot would give it that extra pop! Thank Heidi, I’m so glad you liked it! I have tried it with hotter sausage and I loved it, but the kids protested 🙂 next time I’ll need to make a hotter batch just for me! Would it be possible to use ground turkey in place of the sausage? Thank you. The recipe looks and sounds delicious! Can I use escarole instead of spinach? I made this soup this evening. It’s very cold out today, and my family is worn out from school, sports and work. This was the perfect comfort food dinner! I would add 3 cups of spinach instead of 2 next time and maybe 1.5 pounds of sausage. We used sweet Italian sausage and it was delicious. I added about 1 tsp of italian seasoning when I added the spinach to add some more flavor. Everyone loved this soup and it was simple to put together with just a few ingredients, which is also very nice. Thank you for the recipe! I’ll definitely make this again. if i wanted to add orzo when would i do that? I am new to the IP. Thx! I’ve not used orzo as it’s not gluten free so I’m really not sure when you could add it. Usually the cook time under pressure for pasta is about half the time listed on the box, that’t not always the case. I have a feeling that the 5 minute cook time as listed in my recipe may be too long for orzo, but you could try it and see how it goes. I made this recipe with some added Italian seasoning. AMAZING! It’s so hard to find traditional soups available for those who can’t have gluten. I added some diced GF spaghetti to mimic orzo pasta because my kids love pasta and it was a nice touch!